My latest course from Trinity is called Herbal Preparations and is based around the fantastic book by Max G. Barlow called From the Shepherd's Purse. So now I'm all excited about talking about herbs again and want to share a few favorites with you. One of my favorite herbs and one that I think women of all ages should have in their pantry is Red Raspberry. (Rubus strigosis, Rubus idaeus L., Rubus leucodermis, or Rubus villosus). 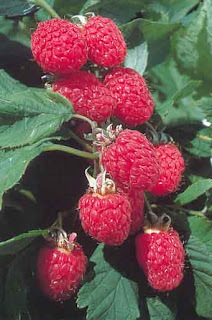 Red raspberry can be found throughout the entire United States and is adept at growing in almost any climate. You can find this bush growing wild or in cultivated gardens. The bark,leaves, roots and berries are all used in herbal preparations. Red raspberry ranks high in iron, manganese, niacin, calcium, magnesium, selenium, vitamin A and vitamin C. It also contains vitamin B, vitamin D, vitamin E vitamin F, potassium, selenium, zinc, and phosphorus. Red Raspberry, because of it's unique combination of nutrients, shows an affinity for the uterus. Listen to this incredible laundry list of ways this herb can help women of any age. Red raspberry can alleviate female abdominal cramps, reduce menstrual bleeding, alleviate morning sickness (especially when combined with peppermint), stop false labor pains, tone the uterus in preparation for childbirth, reduce labor pains, ease childbirth, increase and enrich the milk supply of a nursing mother, strengthen the uterine wall, and reduce hot flashes. Red Raspberry can also promote healthy nails, bones, teeth and skin (it's the calcium); stop diarrhea; heal canker sores, mouth sores, and sore throats when used as a gargle or mouth rinse; balance hyperglycemia and mild high blood pressure; and treat colds, flu, and fevers. Make a tea or standard infusion to drink. See directions below. For constipation mix an ounce of Raspberry Leaves and 1 1/2 ounces of flax seeds and prepare a standard infusion. A standard infusion is simply another term for tea and is one of the easiest ways to take herbal remedies. The usual ratio of herb to water is 1 1/2 ounces of herb to 1 quart of water. Here is my favorite way to make an infusion or tea. Place ground herb into a teapot, suitable glass, or stainless steel container. Pour in just enough cold water to moisten the plant material. Bring distilled water to a boil and pour over moistened herb. Do not bring the herbs themselves to a boil. Let steep for 15 minutes, then pass tea through a strainer. Standard infusions do not last long and should be discarded after several hours. I think I might just head out to the kitchen and brew myself a pot of this wonderful herb right now. By the way, for those of you who live nearby...I have a ton of this in my pantry if you would like to try it. If you don't live locally, try Frontier or Mountain Rose Herbs. They sell very high quality herbs. Barlow, Max G. From The Shepherd's Purse. Hong Kong: Asiaprint Limited, 1990. ISBN 0-9602812-0-7. Shook, Edward E. Advanced Treatise in Herbology. Warsaw, Indiana: Wendell W. Whitman Company, 1999. I have to testify...Karla got me started on this a little over a month ago and I notice a difference when "that time of the month" roled around. I had no pain and a shorter period. I know, that may be too much information, but its true and adding Red Raspberry to my daily routine is all I can attribute it too! I just put a little in my green smoothie everyday. I drink Organic Red Raspberry Leaf Tea almost daily. I love it. My favorite source for it is from Mountain Rose Herbs.